HIGH NOON is proud to present Marisa Baumgartner’s NYC debut solo exhibition, Standing in the Eye. Through personal experience of growing up between two countries as an Austrian-American, the concept of the “binary” became central to Baumgartner’s work. She utilizes this through integrated mixed media and photography, creating a charge of negative and positive spaces echoed in the turblulent subject matter of hurricanes and active volcanoes. 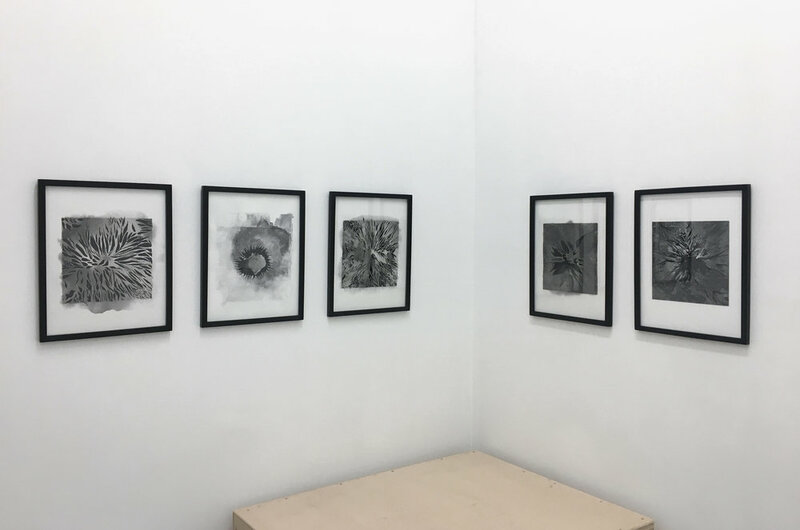 The series is a reverberation of commentary on the aerial views in which she has chosen to reveal spaces and how they’ve been affected by climate change. Through highlighting these areas she brings forth something often ignored while simultaneously concealing it with her mark-making. In certain works, the use of gold leaf references the art-historical illumination of the Byzantine era, playing upon our natural instinct to be enamored by the glint of light on the surface, while masking the latent sinister reality of our environment. She often uses a very muted or entirely black and white color palette as a nod to the philosophy of yin and yang, drawing inspiration from and conversation with the black and white paintings of Minimalism. “Duality forms the basis of my practice as a visual artist,” says Baumgartner of her work. Redacting photographs in an art historical context emphasizes “emotional reactions of what we hide/show of ourselves and psychological layers of distance in how we inhabit our environment.” In compelling us to consider Baumgartner’s decision of what is made absent--- as absence is also a sort of presence--- it becomes a dialectic way of forcing ourselves to acknowledge a certain truth, albeit an inconvenient one. Using beauty (and in the case of the NASA photography, a sublime beauty) as a tool to veil as well as expose the outcry of our world in the likes of Gustav Klimt and Egon Schiele, she allows us to acknowledge our denials with relieving abstract subtlety. In her concurrent Rodeo series, Baumgartner applies her method of veiling to figuration; removing one side of an interaction (in this case a cowboy and a bull or bronco), decontextualizing the event and emphasizing in a symbolic series of feeble images the futility of man’s attempt to control nature. The cowboys are flung from the animal in an acrobatic form, with the same fleeting awkwardness as stills extracted from the grace of olympic diving athletes. The gesture of these fallen cowboys’ forms against the white releases the men from rodeo, transposing them to ecstatic dread. Tying in with the larger body of work’s theme of man and his environment, the viewer is presented with an allegorical third-person perspective as the the cowboy seems powerless against Baumgartner’s desicively visible brushwork surrounding the rider like a snowstorm. Baumgartner’s works on canvas employ a transfer method called a “wintergreen oil transfer” to create a monochromatic photo-based image of a hurricane on the raw surface. Similar to a Doppler radar prediciting the path of the storm, she then builds layers and layers of semitransparent forms in white acrylic oscillating between graphic and atmospheric. The show’s title seems to suggest that we are at the epicenter of an uncontrollable, inevitable event, whether it be environmental, emotional, or political. Throughout it’s multimedia content, the work is never free from irony in speaking to the role of the artist as creator, both as destructive and sublime as human nature. Marisa Baumgartner was born in Washington D.C. in 1980 and raised between Washington and Salzburg, Austria. She received her Bachelor of Fine Arts degree in Photography from The Rhode Island School of Design in 2002 and her Masters of Fine Arts in Photography from Yale University in 2006. She has exhibited worldwide and had her first two museum shows in the US in 2011. Marisa currently lives and works in Brooklyn, NY. Please join us for the opening reception Thursday, May 31 from 6-8PM. Refreshments will be served, and a full-color, limited edition catalog of the exhibition will be published, accompanied by a book release event in the second half of the exhibition. For any additional information about the exhibition or HIGH NOON’s programming, please contact Jared Linge at jared@highnoongallery.com, or call 760.519.1956.